Part Two of My Weight Loss and Running Journey at The Gluten-Free Treadmill! 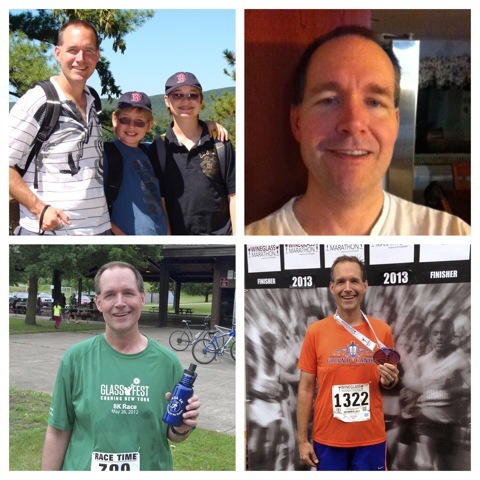 The other day Laura at The Gluten Free Treadmill posted ‘Part 1’ of my weight loss and running journey, which took me from childhood through my post college weight loss and start of running through 2007. You can view it here. Today she has posted my story from 2007 through today. You can find ‘the rest of my story’ at The Gluten Free Treadmill. (Twenty) Five Things Friday – My Quarter Century Runner-versary! 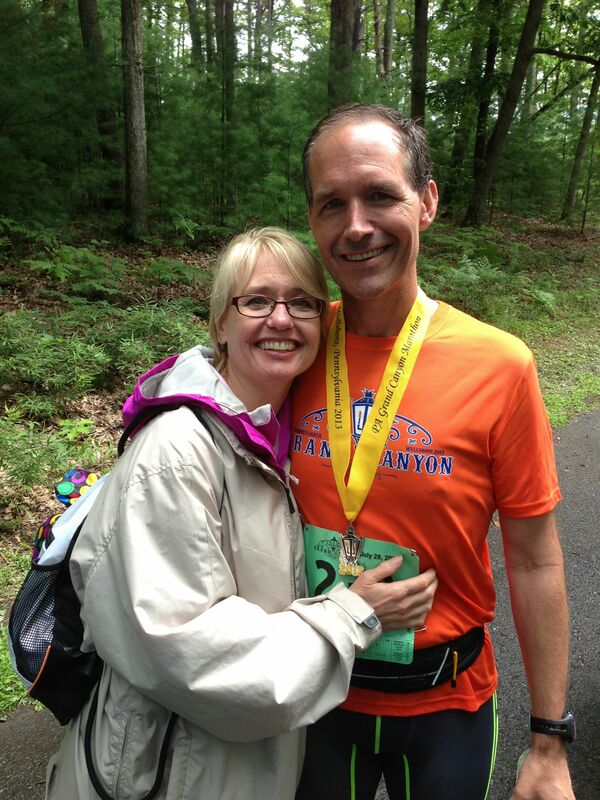 You know it is love when someone will touch you after 26.2 miles in July! OK, so maybe I am a bit late on this one, but perhaps not by much … I never really marked my ‘start date’ for running on a calendar, but I put it pretty accurately in February 1989. That means I have now past 25 years as a runner. I have detailed the history here, here and here. But I thought it would be fun to list out 25 things from all of those years! 1. While I can place the date at February 1989 … I really have no exact idea of WHY I started running. 2. I can still visualize my first route – about a mile, maybe a bit longer with the cul-de-sac road. 4. My first ‘long’ run – it was an accident. I was on business in West Palm Beach, FL and glanced at the map (this was 1991, remember) and headed out. I decided to go one block more, not realizing that the next block was an elongated parallelogram, so I ended up close to 10 miles! 5. Once I started I was hooked, and ran early mornings as I traveled for work – over the 2.5 years I was at my first job I ran in MA, CT, NY, NJ, WV, GA, MS, FL, IL, MI, CA and Germany. And probably other places I’ve forgotten. 6. I wasn’t as early morning at first, starting at 5AM … 4AM came after we moved to Townsend in 1995, and particularly after we had kids. 7. Lisa tried to join me when we first moved into an apartment in Acton, but quickly declared it ‘cold, dark and scary’ and never tried again. Now between joint issues and arthritis it will never happen. 8. Running safety came early – in Acton we lived on ‘Great Rd’, which is Rte 2A – a very busy road and poorly lit. Safety and awareness was key. 9. I have always been a year-round runner, gearing up for whatever came my way. 10. Until 2012 my running shoes were whatever was on sale/clearance for <$50 at the mall and was comfortable. 11. Until 2012 I ran in cotton t-shirts and basic shorts, and my thermal layers were non-wicking … I went cheap on clothes as well. 13. In Townsend, we lived in the ‘snow belt’ and would routinely get >12″ storms. I would regularly run in those. 14. There are no running pictures of me before May 2012. 15. Running when traveling for work can be loads of fun – with Shipley I got annual winter runs in San Jose in February as part of the SPIE conference. The hotels were always in great spots for running. 17. Having my thyroid die has changed everything – my running, energy, and how I deal with cold. 18. Before this winter the coldest temperature I had run in was -10F. Now I have run several below -10, a few lower than -20 and the coldest was below -25F. If I never have to do THAT again it will be just fine! 19. I honestly feared being laughed at and coming in dead last in my first 5K. 20. Total wardrobe shift – It has gotten to the point where last fall my kids asked ‘are you going for a run’ after I had just showered after a long run … and then said ‘at this point, pretty much all of your casual clothes look like running clothes’. 21. ‘Crashing’ at the end of my first half-marathon taught me two things: I had no clue about fueling, and I had no clue about actually being hungry. 22. Probably the most fun running away from home was either trail running the side of a mountain at 8500ft elevation in Park City UT in 2012, or running the Silver Strand on Del Coronado in 2013. – My pace now is ~33% faster than when I restarted in 2012. 24. I cannot say enough about the support of my family – they have been there to support me tremendously, but also give me a rough time and the occasional reality check. 25. I had a great run today, and can't wait for my long Saturday run tomorrow! How long have you been running and what have you learned?